Lotsa 'Splainin' 2 Do: Trying to kick the schadenfreude habit, but backsliding from time to time. Trying to kick the schadenfreude habit, but backsliding from time to time. 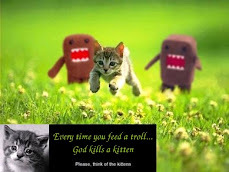 Schadenfreude is the pleasure one feels at the misfortune of others. I consider it a trait for a poorly evolved person, so let me say this about Tom DeLay being found guilty. OOOK OOOK OOK AAH AHH AAAAHHH! 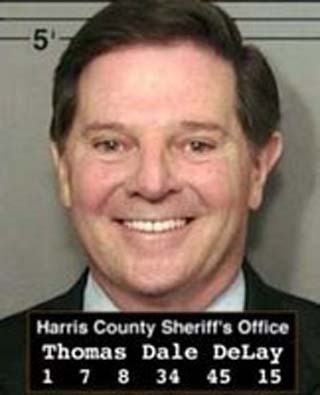 Tom DeLay is the quintessential example of why I hate a certain type of Christian. He smiled in his mug shot so people could see the love of Jesus. He said he wanted a speedy trial, but his lawyers delayed and delayed and delayed the proceedings. Of course, that was his lawyers' doing. His hands were clean, not unlike Pontius Pilate's. The words "liar" and "scumbag" in the dictionary should have this picture next to them. He and his defenders in the press said the charges were nonsensical and a witch hunt and he would be shown to be completely innocent of all charges. After all, all he did was get a check directly from corporations for $190,000 that he couldn't give to political campaigns, sent it instead to the Republican National Committee who sent checks totaling $190,000 to various campaigns. In the period of about one business day. This isn't the textbook definition of money laundering. This is the textbook definition of EXTREMELY BAD money laundering. Money laundering usually follows a convoluted route over an extended period of time. Forensic accountants should be up all night sorting through shadow accounts and dummy corporations and finally at three o'clock in the morning drinking cold coffee say "AHA! That's how they did it. We've got them!" DeLay and his lawyers are now saying it's a gross miscarriage of justice. This was a quick trial and the defense was perfunctory. The jurors took 19 hours to deliberate and they get to have Thanksgiving at home with loved ones. The judge thanked them for their service and so do I. Delay could be sentenced to up to life in prison. I think that is ridiculous when murderers get a couple years. What I would like to see the judge do is count the years between the crime and the trial and multiply that by two. Give Tom DeLay sixteen years in The Big House and tell him it would have been shorter if his lawyers could have pulled their thumbs out of each others' asses a little quicker than they did. Again, I am not feeling very evolved about this, but Tom DeLay gets off easy. I wish we could find a way to get him to be bunk mates with Joran van der Sloot down in Peru. Justice in Texas. Unlike Southern California, they don't play. This is the first I've heard of the verdict. I'll hold off on the "Happy, happy, joy, joy!" until he's actually in jail. I know the feeling. The pathetic showing by his lawyers, considered by many to be The Texas Dream Team, makes me wonder if they don't think they have grounds for appeal or the judge in their back pocket. I think even the Republicans were happy to see him get his due. He was a total jerk when he had the power to force his will on others. If he ever gets to a Texas prison, he will learn what else can be forced on (in) you. A few words from Tiger, Internets superstar. A half full guy in a half empty world. This is why I don't spring for cable. Ranked Choice Voting does its job. These aren't the results you are looking for.